Here at The Sustainable Angle we love to collaborate with like minded sustainable fashion pioneers and for collaborations like this project with Arizona Muse, we assist fashion brands such as Felder Felder to source sustainable fabrics from the 4000 materials in the Future Fabrics Expo from more than 100 companies. Assisting Felder Felder finding the right fabric to dress Arizona Muse resulted first in creating a jumpsuit made with TencelTM fabric made from Lenzing Group’s cellulosic fibres from sustainable certified wood sources, closed loop processed, which is even biodegradable. This exciting collaboration will feature several outfits over the coming months. ​Involved with Fashion Revolution and being a speaker on the panel of TSA’s Future of Fashion talk at London Fashion Week, September 2017. Arizona is becoming an active voice promoting sustainability in fashion. German-born, but certainly London-ensconced, Dani and Annette Felder launched their eponymous brand Felder Felder in 2007/2008, after graduating from the prestigious Central Saint Martins. Their collection was received to critical acclaim, and soon established Felder Felder on the London fashion scene. Felder Felder have looked into ways to introduce a sustainable approach to their creativity, through upcycling, working with sustainable materials and exciting projects. Focusing on creating media savvy designs to push the boundaries of fashion, sustainability, design and technology, they have partnered with BMW-i3, BMW-i8 as well as Formula e.
Developing sustainable processes for 75 Years to make functional fibres for modern society out of cellulose, sourced from certified sustainable wood plantations, processed via a closed loop technology, and being biodegradable, it is the way for the future. 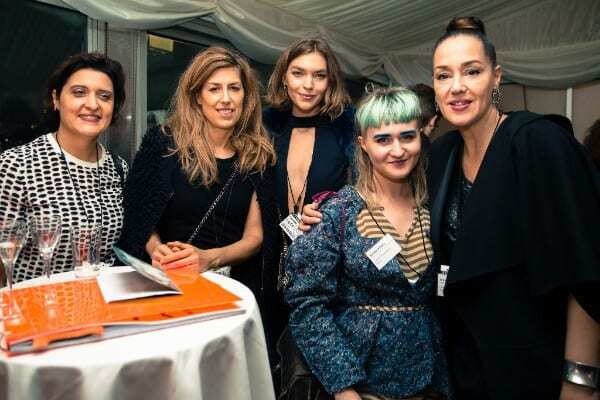 At The Sustainable Angle’s ‘Future of Fashion Talk’ during London Fashion Week September 2017, the three organisations as well as Arizona Muse connected over their mutual commitment to sustainability in fashion.​ Arizona is becoming an active voice promoting sustainability in fashion. Together they are turning ‘occasion dressing’ on its head, demonstrating how it can be stunningly beautiful and responsibly made at the same time. ​The Sustainable Angle brings fashion materials to like minded brands and stars from the world of modelling and film, and facilitates access to sustainable innovative materials for collaborations like this, which sees Felder Felder designing evening looks for Arizona Muse, using Lenzing Group’s fibres.